To promote an image of aging that honors the dignity of older adults and enhances their physical, mental, and spiritual well-being. To offer opportunities for older adults to use their experience and wisdom to plan and implement community programs and services. To support the well-being of older adults through health and social service programs, information and referral to community resources. To assist congregations to define and strengthen their ministry with and for older adults. Life Enrichment– CoAM conducts a variety of courses to promote lifelong learning for older adults. These adventures in learning include humanities series, Bible and faith studies, local and world issues, travelogues, book reviews, and health topics. The Life Enrichment series are held three times a year at centrally-located Bethel Lutheran Church in south Minneapolis. They are offered as follows: a 4-session series in February, a 7-session series in April-May, and a 7-session series in October-November. They are held on Monday mornings from 9:30 to 11:45. Each session offers participants a choice of five subjects from which they can choose two. Choosing becomes the most difficult part for most participants since leaders and speakers are so highly qualified and the topics so challenging and vital. 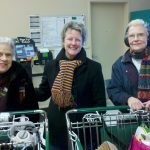 Grocery Shopping Transportation – CoAM provides vans and trained drivers to take people grocery shopping one day a week. Susanna is 89 and lives alone. Eight years ago a neighbor told her about the Grocery Transportation program. She says, “I don’t know what I would have done without the program. Bus Tours – For fun and fellowship, CoAM plans bus tours to interesting places or activities within or close to the metropolitan area. Favored tours are cruises and theater events, and, of course, stopping at an apple orchard during our glorious autumn days. These day tours are conducted four to five times throughout the year. Health Ministry– Each October CoAM sponsors an annual health fair. Various senior organizations feature display tables with representatives present to answer questions. The MVNA provides flu and pneumonia immunizations. Blood pressure checks are also available.